178 Nov 29/12 Another one from the weekend. 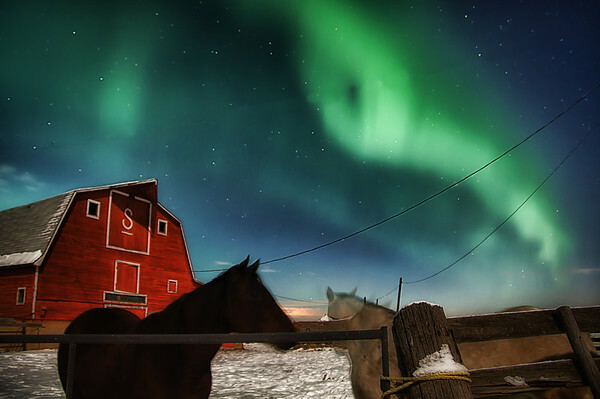 I was trying to get the lights, the barn and a horse in a shot. The horses were quite uncooperative and would not stand still for 20 seconds. Thank you very much for your kind comments yesterday. For those who wish you were here, it's minus 16 Celcius (3.2 Farenheit) and we had more snow overnight. Fantastic view, pov and colors!!! This has a beautiful surreal look to it. Well done. Terrific; I'm amazed the horses were unwilling to cooperate! Ha! beautiful light. I am not sure I would stand still either.